Samsung NP3530EC 15.6" Samsung Core i3 Laptop Intel-2328M, 6GB RAM, 500GB HDD. The anti-reflective 15.6 HD LED display produces images with the sharpest details and boldest colours. Its matt surface has less mirror effect, so you can use it for longer, even outdoors, without your eyes getting tired. And with a slim bezel that's as thin as a finger its also much smaller and lighter to carry. Instant on - get started within a few seconds of opening the display or pressing the power button. An innovative hybrid sleep mode combines the fast start-up of sleep with the stability of hibernation, so you dont have to wait 30 - 60 seconds for the notebook to boot-up. Life on the move is challenging, so notebooks can easily become scratched even after a small amount of use. To protect against the risk of everyday bumps and knocks, a robust Samsung Duracase casing with a special scratch-resistant and anti-fingerprint surface, will keep your notebook looking stylish and like new for longer. Get the right performance for you with the latest 2nd generation Intel Core i3 processor technology. 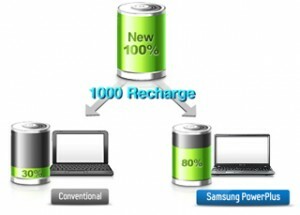 Samsung's intelligent battery charging uses anti-aging technology so the battery keeps 80% of its original capacity for up to 1000 recharges. That's up to 3x longer than a typical battery, which is normally just over 300 cycles, making our batteries more economical as fewer batteries need to be replaced over the life-cycle.